Hold up to 55" flat panel screen or 140 pound weight. Equipped with a security storage cabinet with lock and an inside adjustable shelf in height. Top shelf dimension: 40" W x 20" D.
Middle / bottom shelf dimension: 40" W x 24" D.
Cabinet interior dimension: 39" (W) x 23" (D) x 17"(H). Mounting post size: 29" (W) x 35" (H). 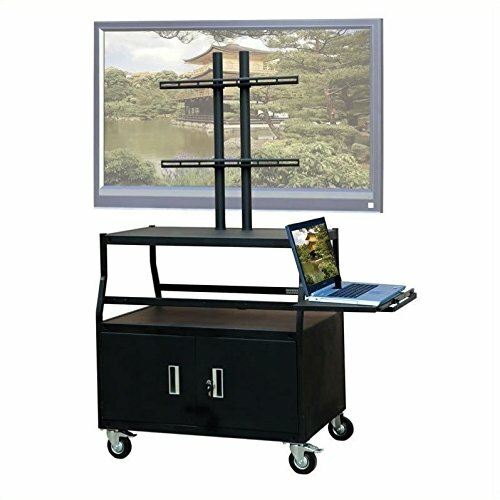 Equipped with 5" swivel industrial plate caster ( two with lock ) and 25' cord, 4 outlets power strip with surge protector and cord winder. Packed in two cartons with total gross weight of 148 pounds. Call our experts at 800 807 1477 for help choosing mounting equipment. If you have any questions about this product by VTI, contact us by completing and submitting the form below. If you are looking for a specif part number, please include it with your message.